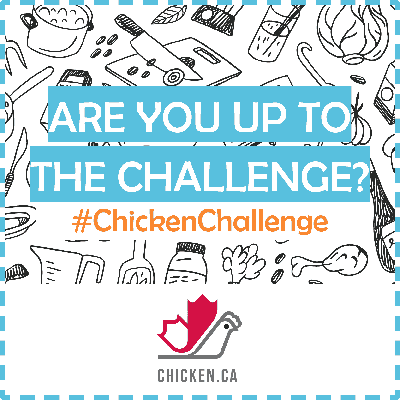 Have you entered The Great Canadian Chicken Challenge yet? There’s still time! Last month, I wrote a post introducing the challenge, how to enter and what you can win. If you missed it, let me quickly re-cap for you. 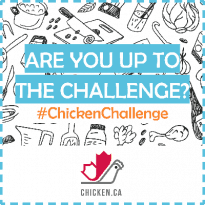 The Great Canadian Chicken Challenge is sponsored by the Chicken Farmers of Canada. 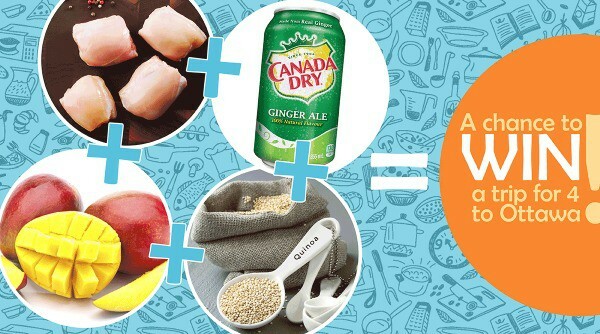 They are inviting Canadians to create a recipe using four key ingredients: ginger ale, quinoa, mango and chicken thighs (but of course!). Your recipe can be whatever you like just as long as it includes those four ingredients. Here’s a few ideas off the top of my head to get your creative juices flowing: salad, soup, stew, stir-fry, entree, side dish, appetizer, chili….the list can go on! And check out these fab prizes! Submit a photo or not. Photos are optional! The contest is open to Canadian residents who are the age of majority in the province or territory of residence at the time of entry. Visit Chicken Farmers of Canada on Facebook to enter. The contest is over on May 29th at 11:59 pm EST. I wanted to show you how easy it is to create a recipe using those four ingredients. 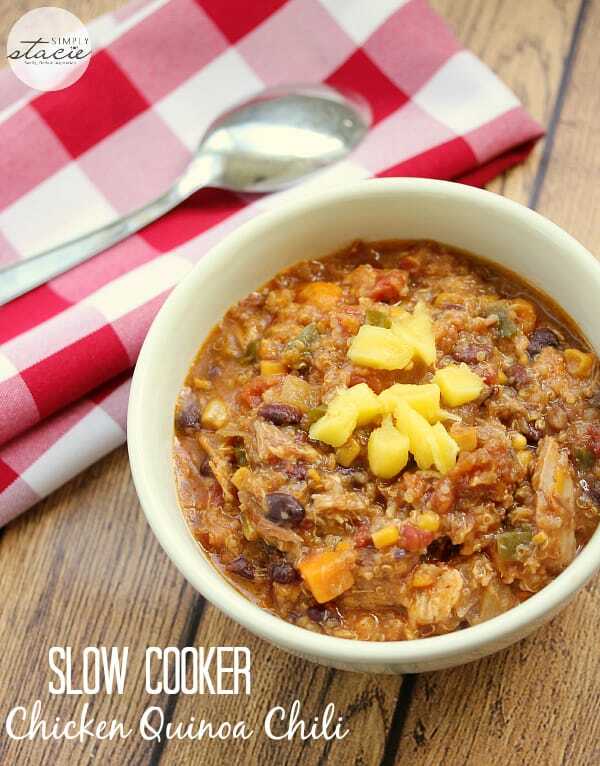 I decided to make a Slow Cooker Quinoa Chicken Chili. I’ve seen recipes with beer in chili so I had hoped it would be ok to use ginger ale instead. I added in a few tablespoonfuls of mango chutney for an extra kick of flavour. This was also my first time cooking quinoa in the slow cooker. 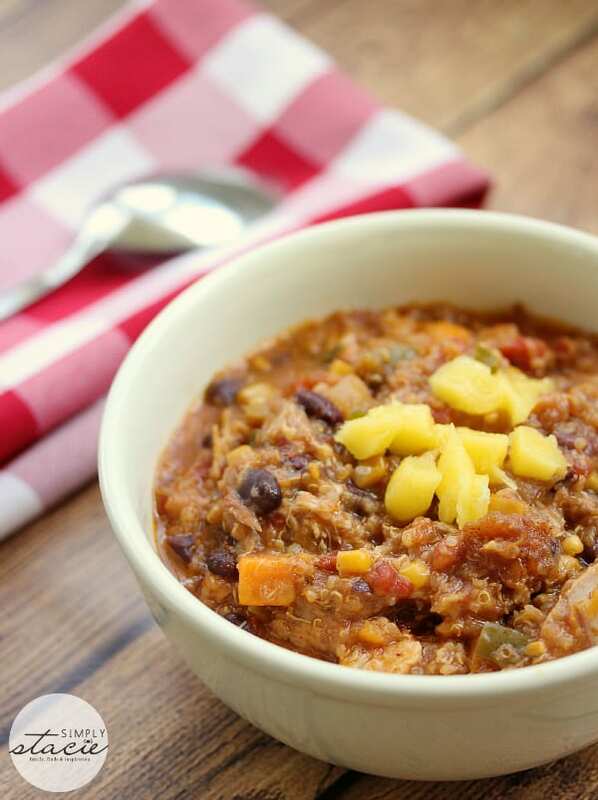 This chili has a sweet heat. It gets the sweetness from the gingerale and mango and the heat from the spices I added. I will say that it is not spicy though. John doesn’t like when I make my chili spicy and he said he preferred this chili to my regular version. It couldn’t have been any easier to make. All I really had to do was chop, measure and put everything in the slow cooker to do its magic. 8 hours later we had a delicious, hearty meal. I encourage you to submit your recipe. There’s great odds and you never know you may be the lucky winner! You could also discover a new family favourite recipe like I did. A delicious twist on a classic! Made with quinoa, mango and a surprise ingredient. Combine all ingredients except the fresh mango into the slow cooker. Cook on low for 8 to 10 hours. Remove chicken thighs and scrape the meat off. The meat should literally fall off the bone. Discard bones and stir shredded chicken into slow cooker. Top with fresh mango and serve hot. Looks delicious! Will try this one.